In order to send text messages from your database you must first follow a 5-step process to setup a Plivo account and link it to your database. Point to Tools in the main menu and click Edit Settings. In the left menu select Text Messages. Setup a Plivo account by clicking the link to www.Plivo.com. Complete the fields on the Sign Up for Free page and click Get Started!. You will receive confirmation that activation instructions have been emailed to you. Make a note of your Plivo account Username and Password for future reference. The email from Plivo provides a link to activate your Plivo account. Click the Activate your account link in the email. Enter your telephone number and click Send verification code or opt to receive the code via phone call. Enter the code and click Verify now. Plivo will confirm the verification. While logged into your Plivo account, click Account. Enter a Recharge Amount (this is your texting credit that will decrease as you send texts). The minimum amount is $25. If you'd like Plivo to automatically charge your credit card when your texting credits get low, click the Auto Recharge checkbox after upgrading your account. You will need to rent at least one number from Plivo. 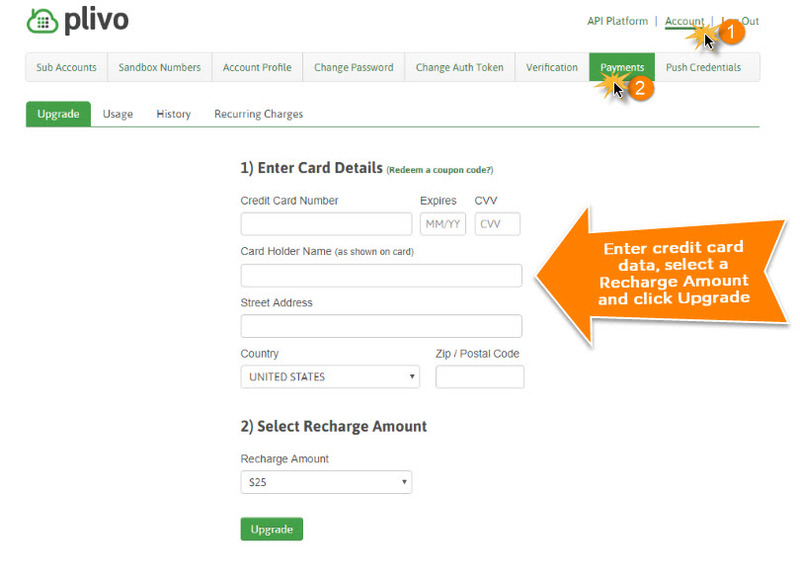 While logged into your Plivo account, click API Platform. Search available numbers and select a number. You will receive confirmation from Plivo that the number was successfully purchased. The Auth ID is displayed on the right. Copy the Auth ID (Ctrl/C). In Jackrabbit, point to Tools > Edit Settings > Text Messages and paste (Ctrl/V) the Auth ID into the Auth ID field. In Plivo, your Auth Token is hidden until you click the Show checkbox. After clicking this checkbox, copy the Auth Token (Ctrl/C). In Jackrabbit, point to Tools > Edit Settings > Text Messages and paste (Ctrl/V) the Auth Token into the Auth Token field. Be sure you've copied the Auth ID and the Auth Token exactly. Do not include any extra spaces. Click the Verify Plivo Account button in Jackrabbit. After your account has verified, you'll be ready to start sending text messages!